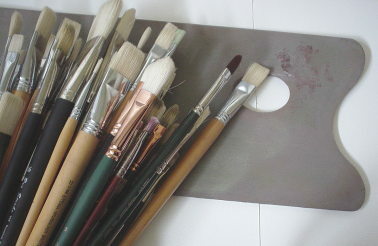 Oil painting brushes are the single most important tool in oil painting. Knowing the different types of brushes, and how they can be used, will allow you to choose the right one for each aspect of your paintings—you'll be surprised at how using the right brush can improve your art! Brushes are made from either stiff or soft hairs. The stiffer bristle brushes are great for moving paint around on a textured canvas. Soft hair brushes are perfect for smooth effects and small detail work. When you know what you want to do, then the question of whether to use bristle brushes or soft brushes should be easy. For years, I have sought a painterly, alla prima look to my oil paintings. As a result, I usually use bristle brushes. I have some soft brushes, but I hardly use them. Bright brushes- They are shaped flat on the end and slightly rounder in the middle. Bright brushes are ideal for painting landscapes, flowers, etc. When pressed sideways, they create broad and bold brush strokes. Or, you can hold it up and use the sharp edge to create thinner lines. Or simply drag them across the surface to create a even sweeping layer. 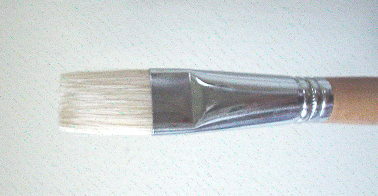 Flat brushes- This type of oil painting brush looks very similar to bright brushes, but the difference is that the hairs are longer. This allows for you to hold slightly more paint with each brush stroke than bright brushes. Otherwise, there is not much significant difference when it comes to brush strokes. They are good for landscapes and still life. Round brushes- Rounds get their name from their round ferrule (the metal part holding the brush hairs). The tip can be round or sometimes pointed. They are designed for more controlled brush strokes. I use them to block in areas or sketch with them on the canvas. Then, after I use big flat or filbert brushes, I move on to add details with round brushes. They are great for more expressive brush strokes and allow you better control. Filbert brushes- These brushes are a compromise between a flat and a round. They have an slight curve at their tip, which allows you to have better control than flat brushes. Filberts are my favorite oil painting brushes. They are especially good for figure painting, and I do a lot of portraits. Of course, you can also use them for other subject matter. You may see other interestingly shaped brushes, such as fan brushes, which are shaped like open Chinese fans. While they are not essential like the first four types listed above, they are good for spreading and blending colors smoothly. You can always do the same thing with other brushes, however, as long as they are broad and smooth enough. If you decide to buy some, one or two should be more than sufficient. Do you use long handled brushes? Long handled brushes are best when painting larger canvases, as they allow you to stand back from the painting for a better view as you work. Shorter brushes are the answer for smaller paintings. The shorter handle provides a better feel and allows for greater accuracy. So pick up a couple sets and feel the difference when you are working on surfaces smaller than 20 x 24 inches (51cm x 62 cm). Each brush manufacturer's sizes differ slightly, so it is best to handle the brushes before you buy them, if you can. 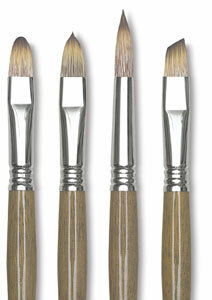 Remember to replace your oil painting brushes once they show signs of wear and tear. As you work with a brush, the bristles wear down and the the shape changes. By the time you have worn down the bristles by 30 to 50 percent around the edges, it's time to toss them away. Just like your toothbrush, it's worthwhile to get new brushes when your old ones wear out. Now it's time to learn how to care for your painting brushes and make them last longer to save money!